6.003 Signals and Systems (Fall 2011, MIT OCW). This consists of 25 video lectures given by Professor Dennis Freeman. 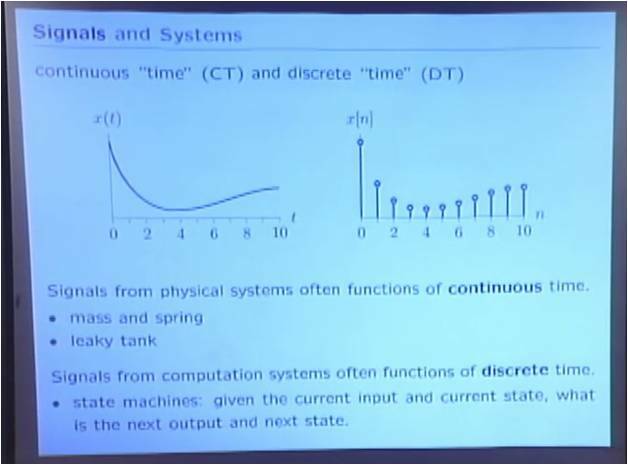 This course covers the fundamentals of signal and system analysis, focusing on representations of discrete-time and continuous-time signals (singularity functions, complex exponentials and geometrics, Fourier representations, Laplace and Z transforms, sampling) and representations of linear, time-invariant systems (difference and differential equations, block diagrams, system functions, poles and zeros, convolution, impulse and step responses, frequency responses). Applications are drawn broadly from engineering and physics, including feedback and control, communications, and signal processing. Instructor: Professor Dennis Freeman. Lecture Notes. Assignments and Solutions. Readings. Exams and Solutions. Download Course Materials. This course covers the fundamentals of signal and system analysis.